2014 has been the year of wearable technology, with wearable technology becoming more stylish, more affordable and more accessible. An estimated 8 million Brits are already using some form of wearable tech, with a further 39% of us intending to use it when it finally goes mainstream. Although the wearables market is currently in its infancy stage, it is expected to see huge advances in the near future, with investment bank Cowen predicting the market to reach $170 billion by 2020. So what exactly is wearable technology? What are smart watches and smart bracelets and what can they do for me? Designed to make life easier and more efficient for us, wearable technology or wearable gadgets are connected to your smart phone and are worn on or close to the body. This means you don’t have to reach for your smart phone or computer to find out information, send messages or emails, get social media notifications, receive calls, play music, check the weather forecast and much more – all of this can be done through a wearable device. Amazon have now even launched a wearable technology store in the UK. Recently, there has been a shift towards designing wearable technology devices that are not only highly practical but also stylish, with many leading tech companies teaming up with fashion designers. Perhaps the most anticipated piece of wearable technology this year has been the Apple Watch, a premium smartwatch with unique features and design set to be released in early 2015. . The Apple watch comes in two case sizes (38mm and 42mm), three collections (Apple Watch, Apple Watch Sport and Apple Watch Edition), and a large range of different bands, closures, and cases, including an 18-karat gold one. The Watch can run a version of several of the common iOs apps, including iTunes, iMessage, Calendar, Maps, Passbook, WhatsApp and more. Best features: A Digital Crown which lets you zoom, scroll, and select without covering the screen. The watch is able to send you notifications and alerts which are relevant to your schedule, and you can grab friends’ attention by tapping them – sending a subtle vibration to their Apple Watch. You can also record and send your own heart rate and draw fun sketches on the screen. The watch automatically adjusts to new time zones and changes itself when daylight saving time begins. Apple Pay: Wearers of the Apple Watch will be able to pay for things on their credit and debit cards straight from their wrists. This is done by using Passbook, an app which lets you store your payment information and pay for goods by holding up the Watch to a contactless reader. Price: The general sale price for the Apple Watch is as yet unknown, but is expected to be over $349 in the USA and £217 in the UK when it is released in early 2015. Motorola’s smartwatch the Moto 360 “stays true to the timeless form of the classic wristwatch”. With its traditional design, a Moto 360 doesn’t feel or look any different from wearing a normal watch. Powered by Android Wear technology, the Moto 360 has been described as ‘comfortable’, ‘stylish’, and ‘surprisingly thin and light’ compared to the Apple Watch. 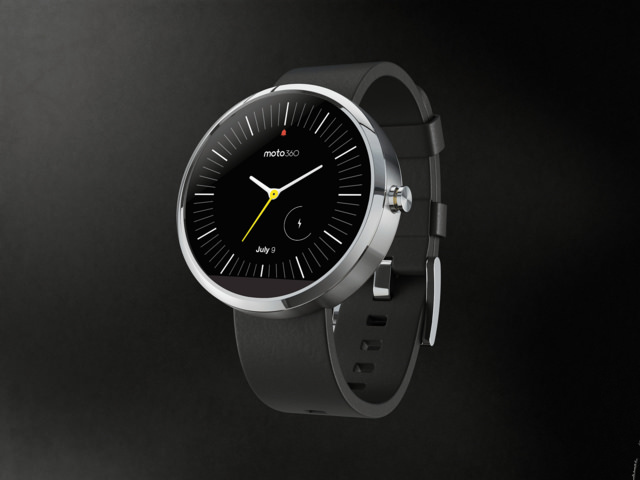 Perhaps the biggest competition for the Apple Watch, the Moto 360 connects to Android smartphones or tablets via Bluetooth. Best features: built in heart rate monitor and pedometer, voice control, weather, directions, notifications based on where you are and what you are doing, flight alerts, traffic, app notifications, six digital watch faces, water resistant, choice of leather or steel straps. Price: The Moto 360 will be sold for £200, making it the most expensive Android smartwatch. It will be available in the UK from October this year. Wearable technology is getting more fashionable, now coming in the form of stylish bracelets. Designed to tackle the problem that many people did not want to buy smart jewellery and accessories as they were not trendy enough, smart bracelets are starting to be produced in a variety of styles and materials. Tech firms are joining forces with fashionable designers and brands to ensure that they create an end product which is both practical and looks good. Described as “the first wearable technology made for women by women”, the MEMI smart bracelet is a stylish, silver bracelet that can deliver call, text, calendar, email and social media notifications while your phone is in your bag. You can customise the settings so that only important notifications come through, meaning you won’t be disturbed by unwanted calls or texts. 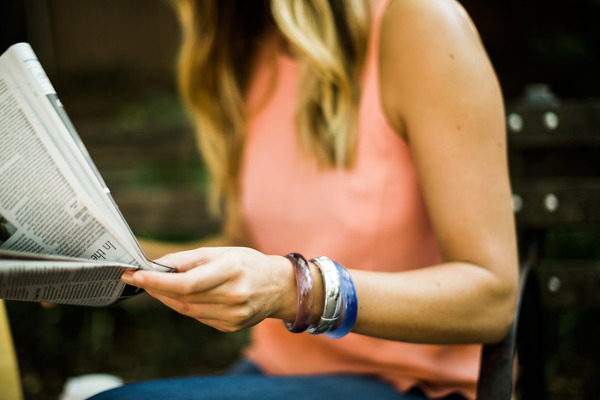 The bracelet was designed by American businesswomen Leslie Pierson and Margaux Guerard to enable busy women to switch off at home and put their phone away, only being notified by a stylish bracelet if something important happens. The MEMI bracelet is only available to use with iOS. Intel is trying to break into the currently non-existent luxury wearable technology market with their high-end smart bracelet MICA, which stands for “My Intelligent Communication Accessory”. The innovative tech firm have teamed up with designers Opening Ceremony to create a sophisticated and elegant bracelet that will come in two styles; white snakeskin with obsidian and tiger’s eye or black snakeskin with pearls, and will be sold at Barneys New York and Opening Ceremony stores from this Christmas season. As well as a collection of smartwatches and smart glasses, Silicon Valley based company MOTA has developed their very first SmartRing. The SmartRing delivers calls, texts, emails and social media notifications instantly to your fingers. It can be used with both Android and iOS devices and comes in either midnight black or pearl white. The SmartRing enables wearers to scroll from screen to screen to view notifications from different applications. The ring was announced officially at Berlin’s IFA consumer-electronics show, and the first production batch is set to be shipped from the US in April 2015. Wearable technology is becoming incorporated with fashion to produce items of clothing that can be connected with smartphones. Advances in technology have allowed designers to bring to life never-before-seen ideas including skirts that change colour depending on the wearer’s mood, dresses that function as mobile phones and shirts that allow wearers to send and receive hugs. Technology companies are now turning to leading fashion designers to help them create clothing and accessories which people want to wear. London-based fashion house, CuteCircuit have designed a brand new, “wearable, sharable and programmable T-shirt”. The T-shirt OS features a 32×32 grid containing 1,024 pixels which is controlled by an app on your smartphone. The t-shirt also comes with a built-in micro camera, microphone, accelerometer, allowing you to pretty much share anything through your t-shirt. The t-shirt is currently in an early prototype stage with no estimated release date yet. Famous singer Nicole Scherzinger turned heads back in 2012 when she stepped out onto the red carpet wearing the world’s first Haute Couture Twitter Dress at the launch of EE’s superfast 4G mobile network in the UK. The dress received tweets in real time and lit them up on the dress with other animations. As well as being highly technical, the dress was high fashion; made from the finest and most delicate French chiffon changeant and decorated with over 2000 triangular Hematite Swarovski Elements. The SkateHoodie is a hoody with a built-in music player, meaning wearers can listen to their tunes whilst exercising without having to carry an iPod or other music player with them. It works by plugging in any USB drive with music files which are automatically played in surround sound. The SkateHoodie can be charged at any personal computer. Take a look at some more of CuteCircuit’s innovative designs, collections and upcoming revolutionary projects. Fitness brand Sensoria have developed a range of wearable technology fitness clothing that lets athletes track their performance and heart rate on a whole new, accurate level. The idea is that athletes can monitor their progress without even noticing a device or gadget, as, put quite simply by them, ‘the garment is the computer’. The range so far includes Sensoria Fitness Socks, a Sensoria Fitness Bra and a Sensoria Fitness T-Shirt. After your work out, the app provides you with detailed graphs, accurate analytics and overall workout breakdown, even showing you your stride and foot landing. You can analyse and improve your performance on a whole new, efficient level. This is still just the beginning for wearable technology, devices and gadgets. With so many advances in technology taking place every day, expect to see noticeable changes in the way we interact with technology. Soon, we won’t even notice it’s there. Wearable technology is essentially computers we never take off. Now, wearable technology is also becoming fashionable and discreet. With major corporations such as Google, Sony, Samsung and Intel already researching and developing innovative smart devices that can fit into busy consumer’s everyday lives, many people are excited to see what the future of mobile and wearable technology has in store.